When all conditions are met, the actions are triggered. All interactions are defined in the Interactions object of the structure of an IO. Let’s see how it works! In the Hierarchy view, when you select the default interaction (Interaction1) you will see an interaction window on the inspector. 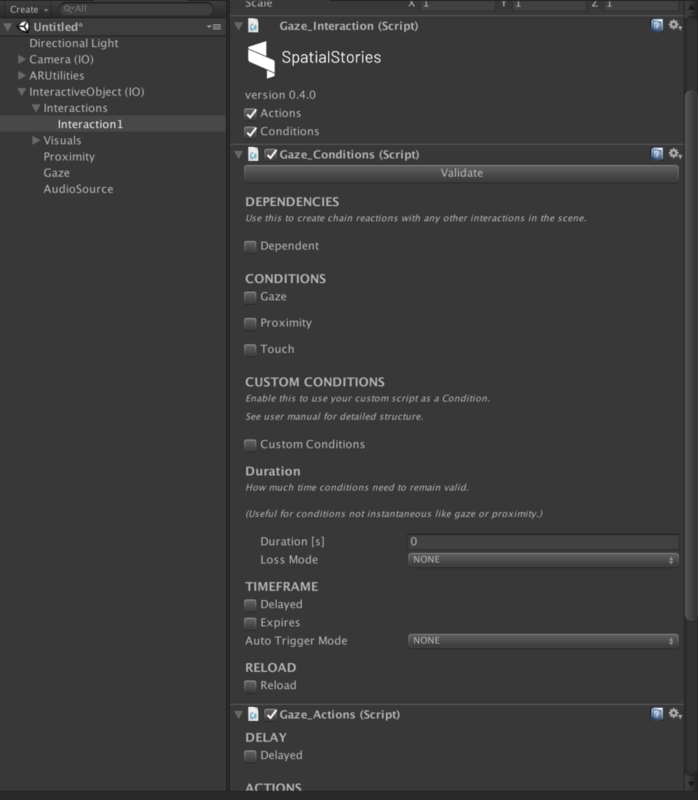 Here you have two checkboxes: one for setting up Conditions and one for setting up Actions. The principle is simple: for any interaction, once its conditions are validated, the defined associated actions will take place. If you don’t define conditions but only actions, they will occur instantly. To add a new Interaction to an IO, simply duplicate any of its exisiting ones. Then you can modify the copied Interaction’s parameters.